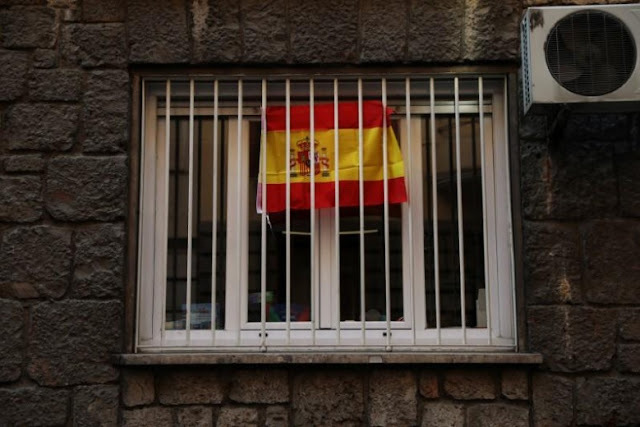 A Spanish flag hangs behind a window fence in Madrid, Spain, October 25, 2017. MADRID - Catalan separatist leader Carles Puigdemont is likely to go to Madrid on Thursday to explain his position on independence from Spain and try to stop the national government imposing direct control on the region. The timing of Puigdemont’s appearance before the Senate suggests he is now unlikely to formally declare independence or call a snap regional election on Thursday, as many analysts had expected. He could still do this on Friday before the Senate strips him of his powers and imposes direct rule from Madrid. An appearance at a Senate debate could pit Puigdemont face to face with Prime Minister Mariano Rajoy who is vehemently opposed to independence for Catalonia. The political crisis, Spain’s worst since democracy was restored four decades ago, has become increasingly fraught at the prospect of civil disobedience and even confrontation if Madrid goes ahead with taking direct control of Catalonia in the next few days. 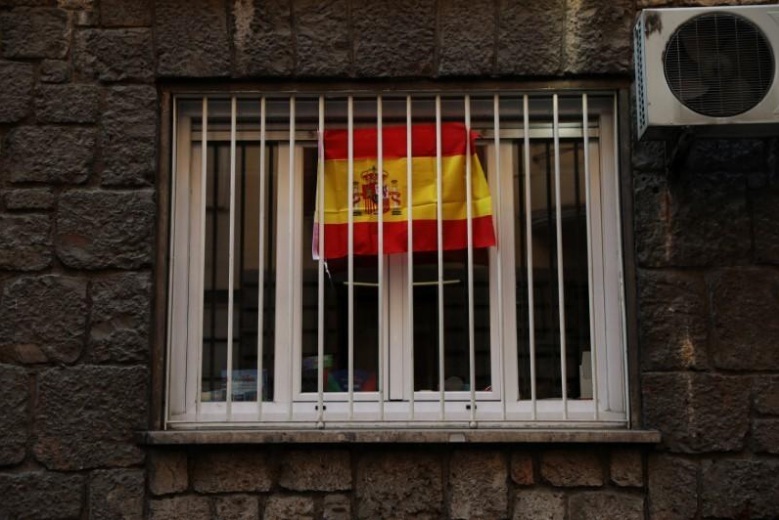 The conflict has caused deep resentment elsewhere in Spain, dented the prosperous region’s economy, and worried other European leaders who see it as fanning separatist sentiment elsewhere on the continent. Secessionists in Catalonia say an independence referendum on Oct. 1 -- which attracted a 43 percent turnout but was mostly boycotted by those Catalans who want to remain in Spain -- has given them a mandate for statehood. The Madrid government declared the referendum illegal and has spurned Puigdemont’s calls for dialogue, instead opting to take control of a region which now has a large measure of autonomy. It has, however, invited Puigdemont to debate in the Senate. “President Puigdemont is willing to attend the Senate to explain the allegations, explain his political position, and explain how we have arrived here,” a lawmaker for PDCat (Catalan Democratic Party) said on Wednesday. Thursday would be the most convenient day, he said. However, Puigdemont is unlikely to make much headway against a government which vehemently opposes full independence and is using all its legal and political power to stop it. On Friday, the Senate is due to strip him of his powers and impose direct rule, although the actual steps could be taken gradually in order not to inflame the situation. Catalonia said on Monday it was confident its officials, including the police, would defy attempts by Madrid to enforce direct rule. A senior Catalan politician said on Tuesday secessionist leaders may call a snap election to try to break the deadlock. The Catalan parliament meets on Thursday and Friday. Some Spanish political and business leaders, along with most Catalan newspapers, have urged Puigdemont to call a regional election before he is stripped of his authority. They say direct rule from Madrid would be a humiliation for Catalonia and pose a serious risk of civil unrest. Calling an election could either strengthen Puigdemont’s mandate if pro-independence parties won, or allow him a graceful exit if they did not. An opinion poll published by the El Periodico newspaper on Sunday showed a snap election would probably have results similar to the last ballot, in 2015, when a coalition of pro-independence parties formed a minority government. Justice Minister Rafael Catala said that if Puigdemont appeared before the Senate, it would help resolve the crisis. Madrid has so far refused to meet him until he drops his call for independence. “If his appearance is within the constitution and the law we’ll be delighted...but if it’s just to ratify his position on Catalonia’s independence, sadly we will not be able to do anything else than continuing with the measures already set by the government,” Catala said. Analyst Antonio Barroso of Teneo Intelligence said Puigdemont was caught between radicals and moderates in the Catalan establishment. Radical elements want him to make the Catalan parliament declare independence unilaterally on Thursday or Friday. This would provoke a tough government reaction, playing into their hands, he said. More moderate voices have said that if he calls an early election, he could stop the imposition of direct rule. Puigdemont is likely to repeat his call for a dialogue between the Catalan authorities and Madrid and remain ambiguous on his next steps, Barroso said. “Both sides are engaged in a game to tag each other with the blame for what happens next,” he said. Catalan separatist leader Carles Puigdemont is likely to go to Madrid on Thursday to explain his position on independence from Spain and try to stop the national government imposing direct control on the region. The timing of Puigdemont’s appearance before the Senate suggests he is now unlikely to formally declare independence or call a snap regional election on Thursday, as many analysts had expected. He could still do this on Friday before the Senate strips him of his powers and imposes direct rule from Madrid.